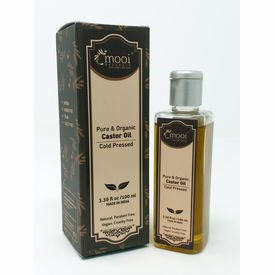 Mooi Naturals Pure Cold pressed Castor Oil replenishes the scalp’s natural oils and revitalizes the hair. The antioxidants in Castor Oil support natural keratin, making the hair stronger and smoother. Castor Oil is also rich in Vitamin E which helps repair split ends. Using castor oil regularly will promote blood flow in the scalp and trigger hair growth. Being antibacterial in nature, it also helps combating bacterial and fungal infections. It helps eyelashes and eye brows grow long and lush. Castor oil when used on lips will give a glossy finish. It is used as natural moisturizer and used on skin to detoxify dead skin cells. Apply Mooi Naturals Castor oil and massage gently on skin or hair. Blend this oil with any Mooi Naturals Carrier oil if you find it too thick and go on with massage. For additional benefits,1-2 teaspoons of this oil can be blended with 4-5 drops of any Mooi Naturals Essential Oil. Rub your lip with 1-2 drops for conditioning chapped lips. Remove nail polish, apply a drop directly on each nail, and rub nail bed & cuticle. Rub Castor oil on heals before applying socks at bedtime to wake up to smooth, soft, and healed feet! For Eyelash growth,delicately run the castor oil dipped cotton swab along the top of your lash line, taking great care to not allow any of the oil into your eye (oil that gets in your eye could be extremely irritating and should be washed out immediately with water)wash off the castor oil in the morning with water or makeup remover.Repeat the procedure for 3-6 months for a noticeable hair growth. 100% pure, cold pressed & organic castor oil derived from the seeds of plant castor (ricinus communis)Mooi Naturals Pure Cold pressed Castor Oil replenishes the scalp’s natural oils and revitalizes the hair. The antioxidants in Castor Oil support natural keratin, making the hair stronger and smoother. Castor Oil is also rich in Vitamin E which helps repair split ends. Using castor oil regularly will promote blood flow in the scalp and trigger hair growth. Being antibacterial in nature, it also helps combating bacterial and fungal infections. It helps eyelashes and eye brows grow long and lush.Castor oil when used on lips will give a glossy finish. It is used as natural moisturizer and used on skin to detoxify dead skin cells.Directions of Usage: Apply Mooi Naturals Castor oil and massage gently on skin or hair. Blend this oil with any Mooi Naturals Carrier oil if you find it too thick and go on with massage. For additional benefits,1-2 teaspoons of this oil can be blended with 4-5 drops of any Mooi Naturals Essential Oil. Rub your lip with 1-2 drops for conditioning chapped lips. Remove nail polish, apply a drop directly on each nail, and rub nail bed & cuticle. Rub Castor oil on heals before applying socks at bedtime to wake up to smooth, soft, and healed feet! For Eyelash growth,delicately run the castor oil dipped cotton swab along the top of your lash line, taking great care to not allow any of the oil into your eye (oil that gets in your eye could be extremely irritating and should be washed out immediately with water)wash off the castor oil in the morning with water or makeup remover.Repeat the procedure for 3-6 months for a noticeable hair growth. 100% pure, cold pressed & organic castor oil derived from the seeds of plant castor (ricinus communis).